Posted on Sun, Jan 29, 2012 : 8:49 a.m. The stiff labels don’t make Maurice Steger sound that exciting, you know? But listen to this guy play—which is precisely what the rapt audience at Rackham Auditorium did Saturday evening, when Steger appeared with the Canadian chamber ensemble Les Violons du Roy, conducted by Bernard Labadie, in a University Musical Society concert—and it’s a whole other story. 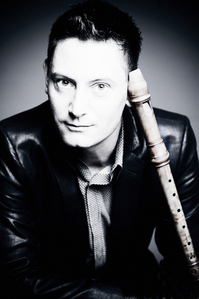 Who knew recorder virtuosity could be that thrilling? But Steger, a man of elfin charm who virtually dances with his instrument and offers blissed-out smiles between extended licks that would wind a marathon runner, is a phenom. Musical in the extreme, witty, clearly having the time of his life, and bending a column of air to his will to make his instrument sing, trill, dip and soar like some sweet unreal bird. It was one of those concerts where you just sort of know a good time was had by all, both onstage and in the hall. Certainly, in this concert of baroque works, a very graceful Labadie seemed to be enjoying himself, whether leading his band with Steger as soloist or focusing the spotlight on the orchestra alone. Like Steger, he’s a dancer, and the plasticity of his phrasing translated to articulate playing that had great gestural clarity, respect for rest as well as motoric energy, and a fine sense of beat and after-beat. In its solo turns, first in Handel’s Concerto Grosso in B-flat Major, Op. 6, No. 7, and then in the devilish variations of the Geminiani/Corelli “La Follia,” the orchestra played with great color (I kept hearing horns in the Handel, though strings and harpsichord were all that were on stage) and finesse. “First-violin soloist Nicole Trotier, a star all night, was exceptional here, playing with the beat with an almost jazz-like freedom. Cellist Benoit Loiselle and lutenist Sylvain Bergeron also had shining moments in the sun in this alternately melancholic and rip-snorting piece. When Steger was on stage, the repartee between soloist and ensemble was adroit and, well, chummy, with Steger seeming to play first to Labadie, then to Trotier; at one point he turned to Loiselle and harpsichordist Richard Pare to synch a cadence and a ritard. Labadie, for his part, achieved wonderful effects (and affects, in the Baroque sense), frequently bringing the orchestra in under Steger so quietly it seemed it was in another room, then turning up the dial dynamically. It was stunning. For sheer virtuosity, and “I can’t believe I’m hearing this” pleasure, the final work of the evening, a transcription for recorder and orchestra, by Geminiani, of an Op. 5 Corelli violin sonata, topped the cake. Whipped cream, cherries on top, more notes per second than you’ve ever heard—it was not only tasty but tasteful. For sheer beauty, though, my vote would go to the Telemann Suite in a minor for Treble Recorder, strings and Basso Continuo, where Steger and his string colleagues partnered each other in glorious, ever-more-ornamented minuets, passepieds and polonaises. The concert needed no encore, but had a short, joyful one in the Allegro from the Vivaldi D Major violin concerto, Op. 3, No. 9, with Steger doing the violinistic honors on his recorder. Sun, Jan 29, 2012 : 10:27 p.m. I would gladly echo the reviewer's comments, and I'd indeed vote for the Telemann Suite. Thanks to all for this so memorable concert!